Imagine bearing clearly-visible evidence of a crime you had committed. Imagine never being able to take off the sigil that branded you as a criminal. Imagine the eyes burning the back of your head, the taunts, the parents protectively grabbing their children when you walked by. The force of this public shaming is a large part of what makes Hillary Jordan’s When She Woke such an interesting novel. Anyone convicted of a serious crime–such as murder–is melachromed: their skin is dyed red, or yellow, or blue (depending on the crime), instantly outing them…and cutting down their chances of survival once they’re reintroduced to public life. 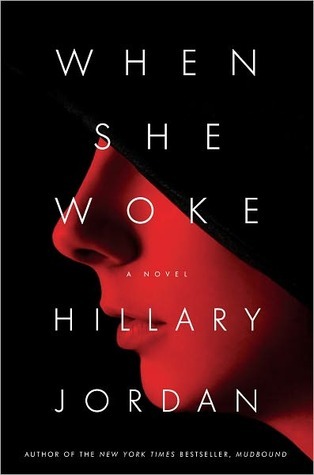 The underlying premise of When She Woke is thoughtful and well-crafted: After a sexually-transmitted “Plague” hits the United States, in addition to other unspecified disasters including overcrowded prisons, a large swath of the country becomes extremely (and I mean EXTREMELY) religiously-conservative, outlawing abortion and establishing a Secretary of Faith position in the presidential cabinet. LGBTQ individuals are seen as pitable freaks at best and agents of Satan at worst. Much like Margaret Atwood’s A Handmaid’s Tale, women are valued only for their ability to procreate, and are expected to be subservient to their husbands’ will. (The truly scary thing is that there are people who really think like this, in 2012, and some of them are even in charge of legislating. Shudder.) Into this frightful (and frighteningly-believable) world, we follow Hannah, a rule-abiding young woman…who has just had an abortion and been melachromed red for the crime of murder. The few glimpses we get of the world outside Texas and Hannah’s small circle are tantalizing. Her friend Kayla, for example, is not nearly as sheltered as Hannah and has been able to date, attend college, and formulate her own views on religion. We hear that abortion is still legal in California and New York, and that diplomatic relations between the U.S. and Canada have been served. I would love to see Jordan explore this world again, in more detail (sequel alert?). The ramifications of this hyper-religious U.S. would be so interesting to see, especially on a global scale. Have we been denounced by the U.N. as a human-rights violator? Have other countries filled the void we left as a superpower? Overall, I very much liked being brought along on Hannah’s journey from shame and guilt to strength and empowerment. Many of the changes she experienced felt very natural, as her horizons broadened through the necessity of survival. Her musings about free will versus predestination were especially interesting, and I would have liked to hear more; her struggles to reconcile her religious beliefs with her new experiences was, I think, very true to what many sheltered individuals go through the first time they are confronted with proof that the world is not as straightforward as they were taught. While some reviewers did not like Jordan’s attempt to counterbalance the negatives of blind religious faith with the benefits of religion, I thought it was a nice touch. Hannah has been steeped in this type of thinking her entire life; even after all she’s been though, it’s much more realistic for her to try to find a way to adapt her religious views than abandon them altogether, at least right away. A few things kept this from being a full four or five star book for me, however. 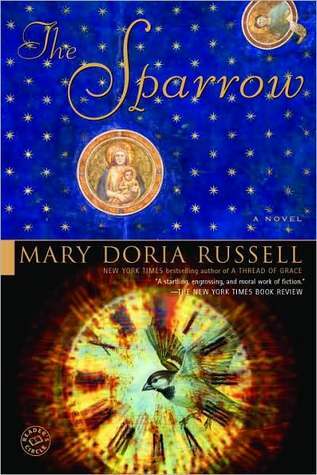 Top Ten Tuesday: Top Ten Non-YA Science Fiction Novels! Tags: book memes, children of men, do androids dream of electric sheep?, dune, passage, science fiction, stranger in a strange land, the forever war, the handmaid's tale, the left hand of darkness, the sparrow, the windup girl, top ten tuesday, who goes there? Top Ten Tuesday is an original feature/weekly meme created by The Broke and the Bookish. Each week, they post a topic and encourage fellow bloggers to list their own top ten answers. This week’s prompt is to choose your top ten books in any genre you would like: historical fiction, dystopian lit, Victorian novels, or romance, just to name a few! I chose to list my Top Ten Non-YA Science Fiction Books, as you’ll see below. Permit me to go off on a tangent for a minute: I chose to do this because as a genre, science fiction written for adults–like fantasy–is often considered juvenile, silly, and unimportant. That’s unfair. Science fiction has a lot of valuable things to say about what it means to be human, about time, about memory, about creation, about our fears, about how this world can be made better. It’s an arena that allows authors and readers to make their own realities, to dream bigger, to innovate and explore–and for that, it’s denigrated? When science fiction is done just right, with relevance to both our lives now and what they might look like in the future, it can be a very moving, powerful experience. So if you don’t consider yourself a sci-fi fan, think about trying one of the novels below! A tale about space exploration and the discovery of a new planet and culture that also chronicles the only survivor’s painful physical and mental recovery. Incredibly powerful and a true homage to human curiosity and resilience. There is some “free love” philosophizing in here that somewhat marred my enjoyment of the book, but the premise–of the first human raised on Mars, brought back to Earth–is strong enough to stand on its own. An extremely realistic portrayal of the lingering effects war has on a soldier, and a great subversion of many typical “space novella” novels. Haldeman fought in the Vietnam War, and this novel is considered by many to be his autobiography of sorts. If you have any interest in climate change and issues of food sovereignty (GMOs, copyrighting seeds, etc. ), this is the book for you. 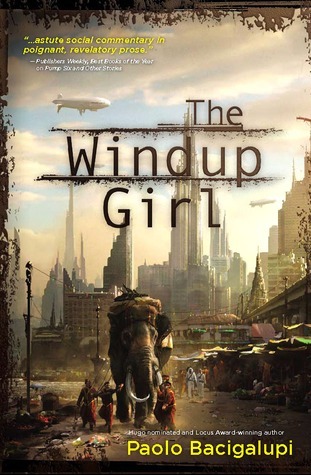 Bacigalupi runs with ideas of biotechnology, human-created natural disasters, and economic meltdowns, and throws them in a futuristic Thailand populated with double-crossing American businessmen, child laborers, rebels, and windup girls. I love this book! It explores what happens to us after we die, as researched by doctors in a hospital–including one doctor who keeps putting herself under to try to solve the mystery. While Atwood has sometimes chafed at being labeled a science fiction author, this tale of a dystopian, theocratic future where women are property whose only purpose is to bear children is chilling enough to make me hope it remains in the realm of fiction. I have recommend this book to everyone, even friends who tell me they don’t like sci-fi–it’s that good. It actually took me two tries to get through this book. (I wasn’t in the right headspace the first time.) Past LeGuin’s impressive descriptions of a cold, bleak planet, she also addresses the question of how a human might navigate a world without gender. It’s both a sci-fi and feminist classic for a reason. 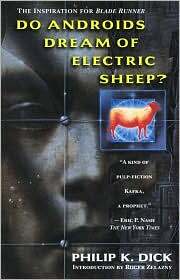 Another science fiction classic (and the basis for a classic sci-fi movie, Bladerunner). The central question is: what does it mean to be human, and how can we even tell when we aren’t human anymore? It’s a bit of a mind-screw. I was I had read this as a much younger nerd, because it follows the structure of Campbell’s Hero’s Journey so closely that after having read tons of other sci-fi and fantasy, Dune can feel a bit formulaic. That’s not Dune’s fault, though! An excellent dystopian future, where everyone is infertile and children are no longer born. A dying world, with no hope of a next generation, is a very bleak one indeed. The world-building here is great, as is the excitement and fright when, it’s discovered, a woman might be pregnant. Bonus! 11. Who Goes There? by John Campbell Jr. The novella that inspired my favorite horror movie, The Thing, is scary in what felt, to me, like a very 1940s way. There’s no overt violence or gore, or even an explanation of what the Thing is or what it looks like. Instead, it’s a subtle, creeping kind of horror–who do you trust and how do you survive when faced with a being that can perfectly mimic not only the appearance of, but also the voice, memories, and personality of, your friends? How do you even trust yourself, when you can be assimilated by the Thing and not even realize it? The physical limitations that the Antarctic setting imposes on the humans only adds to the feeling of claustrophobia. Read it for free here. 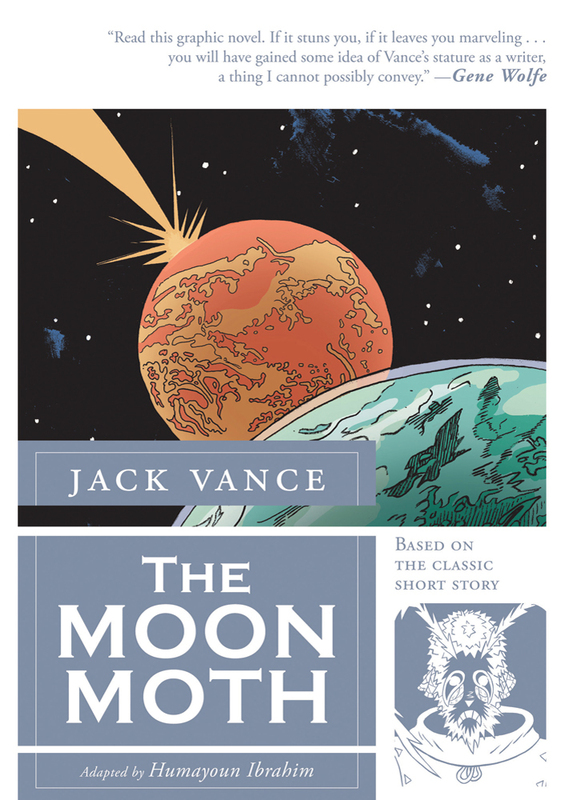 The Moon Moth is a science fiction classic written by Jack Vance, a prolific and well-regarded American sci-fi, fantasy, and mystery writer. Originally published in 1961, the graphic novel edition of the story I read was adapted and illustrated by Humayoun Ibrahim. This was my first experience with Vance, and I thought starting off with a graphic novel would be an interesting way to start my exploration of his works. And I was right! Faced with an alien culture where all individuals have to wear masks, how can an outworlder fit in–and locate a recently-arrived killer? While the story takes place in the future, on another planet, I found the questions it illuminated applicable to today (which the best sci-fi should do). Though we may not wear beautiful, painted masks like the Sirenese do in The Moon Moth, we are expected to hide our true feelings–especially if they are ugly, like fear, jealousy, or hate–and we can only recognize and acknowledge one another when we are “masked.” You could even say that the functioning of society necessitates our wearing of these masks–and it’s when they start to slip that we are faced with murder, poverty, and war. So what could have been simply a thriller placed on an alien world instead became a meditation on what it means to feel, and how we choose to communicate those feelings in public. I love that this story brought up these issues! The artistic style tended to be straightforward, without too many embellishments to detract from the story. The titular Moon Moth mask is kind of ugly, but others’ masks and the landscapes were very intricate and I appreciated Ibrahim’s attention to detail. My one concern with the art was the choice to make the Sirenese slaves black, while our protagonist and other characters in positions of power were white. There was no context given to this choice, and it detracted both from my enjoyment of the novel and the sense that this was in a far-flung and advanced civilization. However, I’m not sure if the original text mandates this, or if it was a choice of the illustrator. Something that I instead enjoyed was the way music was illustrated in the text–something that could have been clunky was instead handled clearly and creatively. In the world of Sirene, musical instruments are of huge importance to communication and society. Each individual is expected to know how to play 6 or 7 instruments, and know in what social situation each instrument is appropriate. (As someone who is terrible at playing music, this would be my hell, btw.) For example, when talking to a slave, you should use your hymerkin, but when talking to people above your social status, you’ll need to use your kiv or your zachinko. Visually, the music was depicted as differently colored and patterned shapes encircling the characters’ text: our protagonist’s use of the strapan was always shown as light blue stars, crescent moons, and rays, while using his hymerkin to speak was drawn as sharp, discordant red triangles. If you are unfamiliar with the stories of Vance, like I was, or if you’re already a fan but would like to approach his writing in a new way, I would highly recommend you take a look at the graphic novel version of The Moon Moth! I received an advance copy of this book for review from publisher Macmillan through NetGalley. The Moon Moth will be released on May 22nd.